Imagine, for a moment, being a kid participating in the Olympics. There is an exciting opening ceremony. You compete, and afterwards you stand on the podium while someone hangs a medal around your neck. Thousands of kids and young adults were hoping to get that moment at the Amateaur Athletic Union (AAU) Junior Olympic Games. This summer the annual event was held in Des Moines, Iowa, from July 24 through August 4. “The experience is just like the Olympics,” said Paul Campbell, the national chairman for the Junior Olympic Games. Campbell estimated that between 16,000 to 17,000 kids and young adults competed. 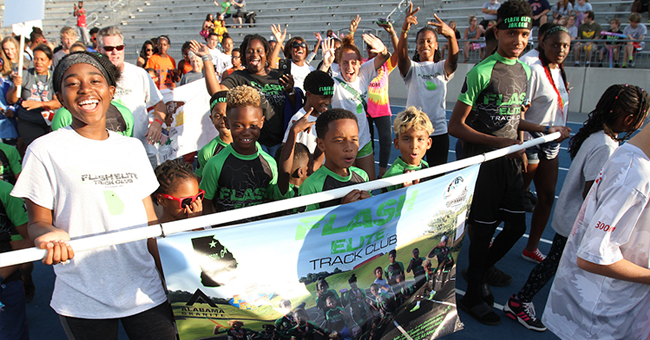 Of the 20 sports that were offered, track and field had the most participants, with 10,040 athletes. A new sport to the Junior Olympics this year was pickleball. Yvonne Devlin, the AAU pickleball national chair, said the sport is a combination of badminton, tennis, and Ping-Pong. Although just 18 kids competed for a spot on the podium, Devlin said the sport is heating up nationwide. “Pickleball is a great sport right now,” she said. Two sisters from Bloomington, Minnesota, agree, and I caught up with them after I competed in baton twirling. When 16-year-old Isabella Boudreau and her sister saw the game being played at a local gym, they decided to give it a try. It’s been a year and a half, and the sisters are hooked. “We immediately fell in love,” Isabella said. Her 13-year-old sister, Gabrielle, said her pickleball competition at the Junior Olympics was friendly to those across the court. “It's competitive, but everyone is so nice,” she said. The sisters earned a gold medal in doubles. Another pickleball doubles team was Carter Madison, age 11, and Bryce Dawes, age 10. The teammates are from Adel, Iowa. Dawes said that he has played for over a year and was glad that pickleball was a part of the Junior Olympics. “It was really exciting and fun,” he said while wearing a gold medal around his neck. Another sport held during the Junior Olympics was girls wrestling. Chloe Dearwester, age 12, beamed proudly as she stood on the first-place podium wearing a gold medal. Dearwester said her competition was tough this year. “All the girls really worked hard,” she said. She started wrestling in her home state of Ohio when she was 10. This is her second year competing at the Junior Olympics, and she said she was grateful to return. “This is a great opportunity,” she said. 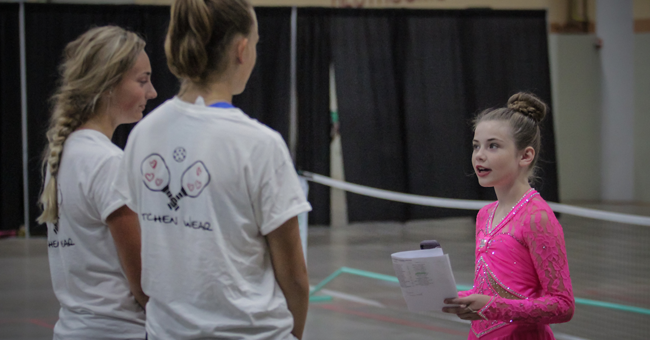 Baton twirlers from across the country also competed at the Junior Olympics. One of the twirlers was Stephanie Hill from Toledo, Ohio. The 19-year-old started twirling at the age of five. Her sister, mother, and grandmother all twirled, so it was only natural for Hill to pick up a baton. “It’s a family tradition,” she said. 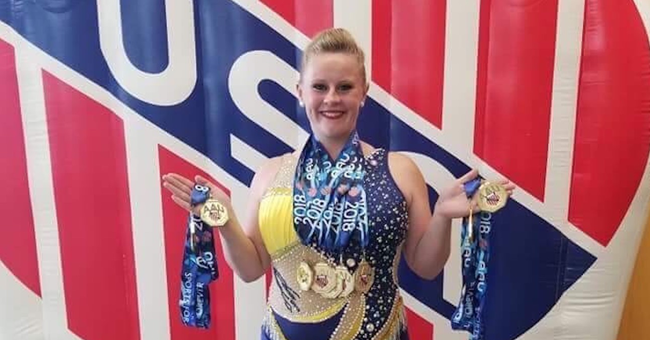 Hill, the feature twirler at the University of Toledo, heard there was a lot of good competition at the Junior Olympics, and after seeing the other twirlers’ routines in Des Moines, she agreed. “A lot of people don’t have the opportunity that we all have here at AAU and being able to show that I could make gold,” said Hill, who earned nine medals of that color. For kids wanting to try for a medal of their own, the 2019 Junior Olympics will be held in Greensboro, North Carolina, from July 24 through August 3.